Legend is a personal narrative originating from the 1985 movie Legend, about a young woman attempting to save the last unicorn on Earth. Borrowing the subtitles for the movie's sounds, which appear in parentheses (owl hooting) (wolf howling) (unicorn whinnying), I construct my own Pagan romance. Now the isolated sounds of gallops and cries invade my footage, and the story begins anew. What tumultuous maelstroms of good and evil unfold in sound's concentrated energies! 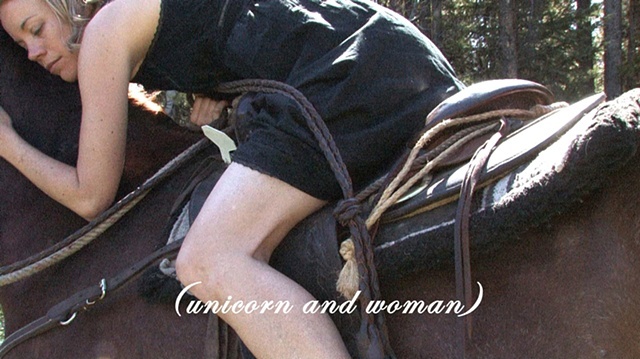 See the woman and the unicorn dangerously trodding the rivers of darkness once again. They almost get lost in its brutality. Yet sound itself, that splendid flame of every story, burns the film down to its last song of sorrow and joy. The terrible sea falls away, and unicorn and woman emerge unscathed, the final romance of light bursting out of ashes. They become almost one. Now Legend is my soul's own imperial tune, and most true.